I am building a full size flying replica Spitfire. It is a two place, dual control aircraft designed as a practical, aerobatic aircraft based on a MkIX. The weight is aprox 1000kg, 2200lbs.,and the power is 340hp. which gives a sparking performance. The designed load factors are in excess of + 6 -4g. The wings fold for transport and to reduce hangerage etc. If anyone is planning or doing something similar I would be very interested to hear from you. You will see from the website that I am intending to offer the mouldings and a kit at a later date when we have successfully flown the prototype. The project represents a life-time's ambition ( and possibly obsession !! ). Comments, observations etc. are always very welcome. I am planning to build a full scale replica once my shop is built. Only difference is that I want a Merlin powereing mine up and over the big blue sky! Ride/Fly it like you stole it! Building mine now, early Mk. Still drawing, but also making some parts. Engine? Probably an Allison when the times comes. Who can afford a Merlin? Converted Meteor, maybe, too far down the road to think about now? In the process of making a 3 axis CNC machine, to make cast aluminum parts, via the lost foam method (BFP, gun sight mounts). Fuselage will be to factory spec, making lots of frame form blocks, and hammering aluminum. Don't let anyone tell you can't do it, if I can do it, you can. Anyone have top cowling offsets, dimensions for an early Mk up to a MkV? I'm a long-term enthusiast of building replica Spitfires - I have plans for an Isaacs 60% Spit lying around here somewhere! Would be interested in hearing progress on these replicas, if possible? I'm slowly plugging away on my project. It's just a hobby, and I try to keep that perspective, abeit: full scale and as original as I can make it. The newest things have been BFP bracket drawings and buying instruments off Ebay. I'll be working on casting BFP brackets in the spring, or at least trying to teach myself how to cast aluminum. I've been looking for top cowling drawings with not much luck. Frame 8 is all but done, and I may start on frame 11 soon. The frames are not that hard to make, just time consuming. Nice one...Now where are the pics dammitt!!! 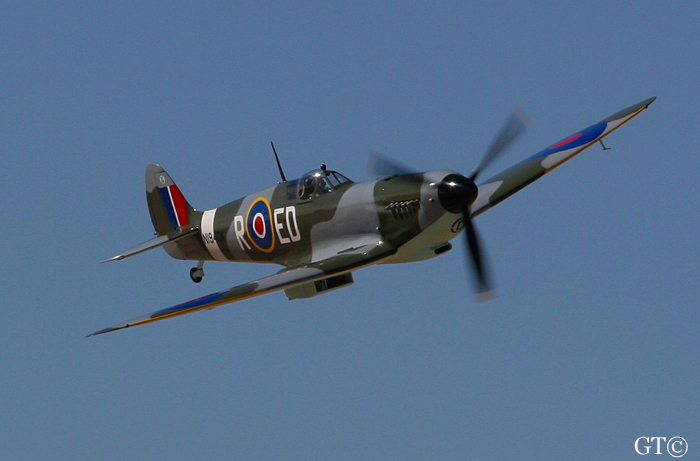 There are about 8 building "Spitfire Aircraft Company Ltd" full size Spitfire replicas around the globe. They are an upgraded version of the Clive du Cros K5054 replica being a full size all wood aircraft powered by a V12 Jag engine. Russ Harmuth (an American) had it re-engineered to be fitted with a Merlin or an Allison. The main change was to cover the entire airframe with a ply - balsa - ply laminated skin (like a Mosquito) and beef up main structural pieces. If you want pictures go to www.spitfireaircraftco.com , lots of progress pictures there. I didn't realise there were so many building the Spitfire Aircraft Co. replica (I only knew of one other than the prototype!). The other has an aluminium-clad welded steel tube fuselage, with wooden wings, and is also Allison-powered. The prop came off a DC-3 originally. Apart from that, and a few other minor details, you'd swear this was the real McCoy! Try looking up Legend of Aces. Andy Keenan is/was building a Jurca spitfire, and it's chronicled on their site. I believe it's been sold. I've lost touch with Andy, I've tried calling and e-mailing with no luck. If anyone knows how to get a hold of him, I would appreciate it. Just want to make sure he's all right. I've just begun building an MJ-100 Full size Spitfire. I'm going to model mine after the MkIXC. Almost aquired an Allison V-1710-85 (1425hp WER rating) for $12,000. Got sold before I could even email about it. I'm constantly looking for the V1710-111 (left hand turning 1600hp used in the P-38 Lighting). Contrary to belief, Allisons can use two stage two speed superchargers, and they were made by Allisons late in the war. The twin boom P-82 twin Mustang used the V1710-143 that produced something over 2300hp. One of the most powerful variant Allison's the V1710-127 produced up to 2900hp. I might even do mockups of the Hispano Suiza 20mm autocannons(two) and four .50 cal. browning machine guns. There's a couple of guys in Australia developing full-scale, ALL-METAL kits of the Spitfire, using more modern engines. These are more like light aircraft than replica fighters, but they don't look too bad from what I've seen. One has flown, the other is still under construction. Yes, I've also been considering putting a Falconer V12, briefly talked to Ryan Falconer about producing a V12 with at least 1600hp. The Thunder Mustang used his V12 to great success. I just like the idea of using engines actually produced during WW 2. The Legend of Aces and Jurca Plans West website has been considering changing the wood wings to metal. But like the Hawker Hurricane and Dehav. Mosquito, wood worked well for them. Seriously considering the 20mm autocannons and 50cal browning machine guns if I can find them. Wow! Hi there! From the very first time of seeing a spitfire in action I fell head over heals in love with it and since then have dreamed of flying one. After years of trying to get spitfire models to fly with not a lot of success and cash, it's just not the same. I am currently a 22 year old student just completing my degree in Aerospace Engineering Design in hopes to one earn enough and know enough to build my own and fly it on my own airstrip somewhere. I know that theres a big chance i'll never be able to achieve it but all that said I was wondering if anyone could give advice as to where to start in realising the dream? To begin with get down to the local Aviation museum and volunteer.To build you need drawings,money,a workshop and the remains of a wreck.Also get in touch with your countries governing body on eligablilty of registration. From there just follow your nose.